Welcome to Ward 5 Online: Magoun Square Gets a Bike Corral! Magoun Square Gets a Bike Corral! Magoun Square was just one in many locations that received bike corrals courtesy of a MassDOT grant in the past week. The original placement of the corral would have taken up a parking spot (similar to other locations), however, Greg Coughlin Owner of Olde Magoun's Saloon donated the right side of his building to the corral where it sits behind a fire lane sign. The corral lines perfectly up against the building, is illuminated for night time visitors, and poses no interference with drivers exiting out of the CVS parking lot. A parking crunch in the heart of Magoun Square prompted two business owners to request the placement of the corral to be moved. 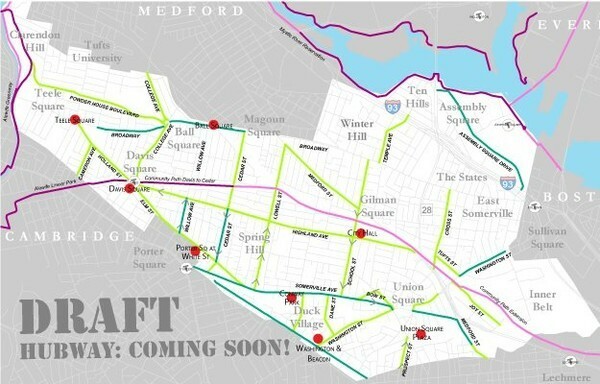 Somerville is home to many bicycle-friendly features including newly painted bike sharrows, widened sidewalks, curb cuts, increased bicycle parking structures, and (in specific locations) Hubway bike sharing stations. It is my understanding that a bike corral only takes up one parking space, not two.